Arrival in Zurich. Drive to Speyer. Visit of the Imperial Cathedral to Speyer, in the 11./12. Was built in the 19th century and has been on the UNESCO World Heritage List since 1981. Continue to Worms, visit the cathedral. At the Diet of Worms in 1521 Martin Luther had to answer before the Emperor Charles V, which resulted in the break in the Western Church. Dinner and overnight in Worms. After breakfast we drive to Trier, which is the oldest city in Germany. Here we visit the Hohen Dom zu Trier - the oldest bishop church in Germany. We drive along the Moselle to Bernkastel-Kues, where we check in for two nights at the hotel. At dinner, there is the opportunity Mosel wines to taste. can be visited independently. In the late afternoon we drive back to our hotel in Bernstkastel-Kues and enjoy dinner there. is the abbey church from 1156. It is a jewel of romantic architecture. 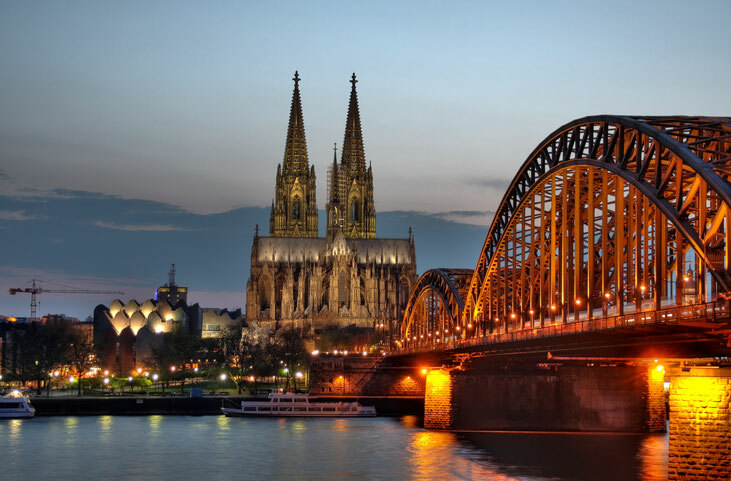 After our visit we leave the Eifel and continue to Cologne. Arrived in Cologne, we experience another highlight of our trip - the Cologne Cathedral. It houses many works of art from the 9th cent. Among them are the relics of the Three Kings. After a tour of the cathedral and a short rest we continue our way to Koblenz, where we stay for 2 nights in the hotel. was declared a UNESCO World Heritage Site in 2002. Lunch optional in St. Gorarshausen. Then we will be picked up from the bus and returned to Koblenz in our hotel. We can arrange the afternoon freely. Only in 30 minutes. We reach on foot the historic old town with its romantic streets and the Liebfrauenkirche. Dinner and overnight at the hotel.